Cartoon Network, an American cable television network which mainly airs animated programming, has a lots of fans in Russia. For further development and promotion in this country, they decided to run a really enticing promotional campaign. To participate, you have to visit the CN official website containing a special promo-section. Here you will find a short quiz consisting of 2 questions. Think you know CN series? Then try out your knowledge and see how well you really know your favourite cartoons! 3 lucky winners will be entitled to a set of cool promotional items by CN: a backpack, a tee shirt, a school set (which is very timely) and a pendant. 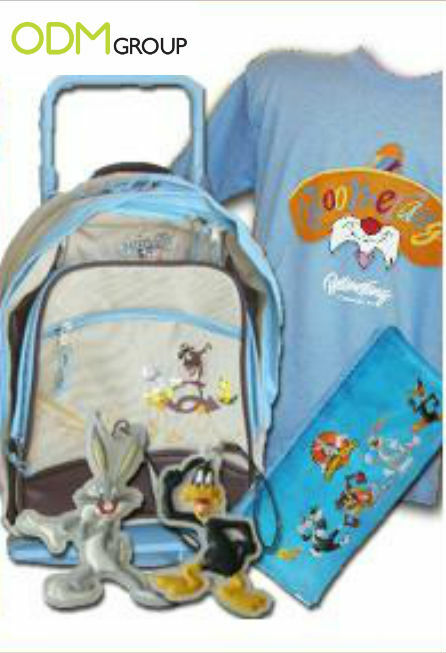 As you can see from the picture, all the items have cartoon licensed characters on them – children will love that! This friendly challenge will encourage lots of kids to take part in this contest. Thus, CN will collect lots of valuable personal information from its target audience and draw massive amount of traffic to their website. Furthermore, all the promotional products are branded, which will enhance brand recognition. Flora Promotional Gifts – Win Your Dream Bike! Американский кабельный канал CN предлагает своим юным поклонникам принять участие в конкурсе и выиграть отличные подарки! Для этого, ребятишки должны ответить на вопросы викторины и предоставить контактную информацию для получения подарков в случае выигрыша. Эти данные также пригодятся компании для дальнейшего исследования целевой аудитории.